I remember in Nopember 2014, I made a plan with my travelling friend to visit Kawah Ijen, It is a one of mountain in the East Java Province. My travelling friend who had the idea and I thought ‘why not’ since I never been to the place and I will get new experience. By travelling, I believe that many things I will get from it. Not only the beautiful scenery but also more knowledge about the social economic happened in there. To make a short story, I only tell about the beautiful paradise both of the scenery and the activities happen in there. About the scenery, the photo below is Kawah Ijen or Ijen Crater. I call It’s a very beautiful Paradise, why I call beautiful paradise? There are two reasons. The first reason is about the water of Crater, when the sun is shining in the morning, the water of Kawah Ijen looks turquoise color. I feel that my ascent of Kawah Ijen be avenged by beautiful scenery in the top of mountain. After seeing paradise of Kawah Ijen, I feel the satisfaction accent and tiredness disappear. And the second is ‘Blue fire’ or the fire which emits blue color from the crater. 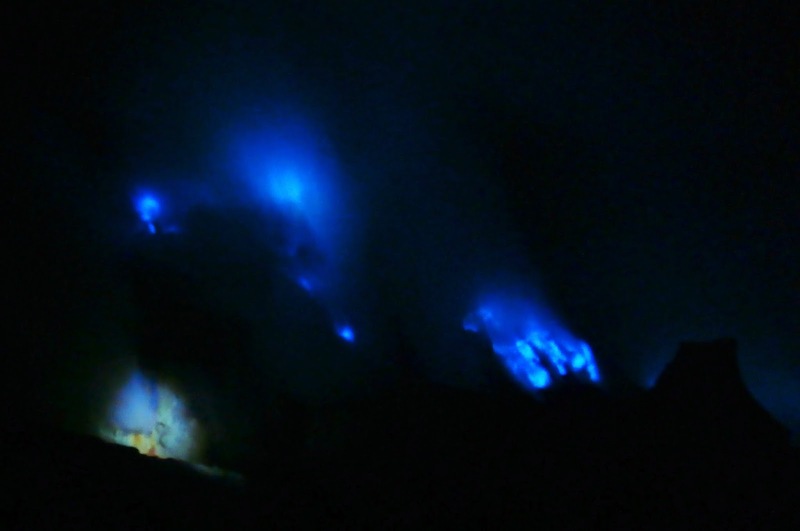 Blue fire is one of wonders of the world, because not all the active mountains haven’t blue fire. We can see blue fire only at the night. The color of blue is so beautiful and as I now in Indonesia only available at Kawah Ijen. So, I really feel the paradise in Kawah Ijen. The second interesting to be revealed in Kawah ijen is sulfur mining activities. Sulfur mining activities here which is still conducted traditionally. At first glance my observation, this work actually has enough big risk for safety. The sulfur miners starting their activities at 00.00 am. They should climb to the top of Ijen Mountain about 2 km and then they should down to the steep rock about 800 m. After they get enough sulfur, they should take the sulfur by shouldered climb to the steep rock and then walking down of Ijen Mountain. The number of mining should be carried by the miner no lightweight, but it is too heavy. The information from the miner, the weight is about 60 kg until 90 kg. The other challenge is if the miner walking in the wrong tracking, it will threaten safety of life. From the sulfur effect caused certainly have an impact on health. The sulfur fumes coming out of the crater in considerable amounts would cause coughing and respiratory damage. So it’s a really not easy to do this work and need deftness in all processing this work. At that time, I asked to them why they choose as the sulfur miner with the big risk on safety and healthy? The classic answer is they have no other choice beside as the sulfur miner. If they don’t take sulfur, they can’t provide their basic needs and fund their children’s school. Usually the average of sulfur taken around 60 kg until 90 kg, the price of sulfur is 1.000 rupiah per kilogram. It is conclude that their salary in one mine around 60.000 rupiahs until 90.000 rupiahs. From my little observation related with sulfur mine activities in Kawah Ijen, the question arises whether there is no other way for the sulfur miners easier besides in traditionally. In the same time, I think the simple thing that it is possible for the sulfur miner in Kawah Ijen use wheelbarrows to carry their sulfur from the place of sulfur taking until the last weighing post. Moreover, a climbing track of Kawah Ijen is good enough and possible to pass the wheelbarrows. The possible thing to do is constructing and improving the special miner track with safe quality. From two sides in the above description, the challenges is how the rules of the government, private, and community to participate in developing of Kawah Ijen?